I was sitting down and productively playing FreeCell (a card game that is loaded on my computer), when my wife came up behind me and said: "You can't believe what I just heard on television!" "Uh what?" I asked as I intently placed a virtual two over a virtual ace. "I was reading while the TV was playing in the background," related my wife. "I sort of half heard something sounding like a prayer. All at once I realized what was going on. 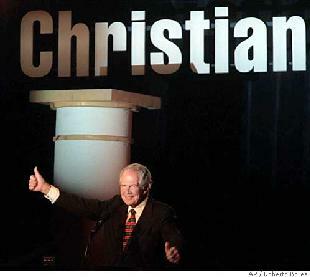 It was Pat Robertson's 700 Club and they were praying that three of the liberal Supreme Court justices would die." "Huh?" I stop playing cards. "They were praying that people die?" "That's what it sounded like to me," continued my wife. "It caused chills to go down my spine when I heard it." I turned away from my computer and said, "You might have been mistaken. I can't believe that Pat Robertson would do anything like that. I mean you make it sound like Voodoo or black magic instead of Christianity." My wife left the room, and I looked at the TV. I wondered when I might get an opportunity to catch an edition of the 700 Club. I thought it might be interesting if I could find out for myself. I discovered that I had a number of choices. I could watch the 700 Club five different times each day. My TV listings for the club started at 7:00 AM on Family, Noon on Trinity, Two PM on Fox, Eight on Family again and just in case I missed something, the Family Channel would give me one last opportunity at 11:00 PM. I didn't have to wait long to watch Robertson's program. The first half consisted of news and features. We had miracle stories, Christian rock bands, some news followed by Pat's commentary. (I have to admit that I grew a bit bored). The exciting stuff didn't happen until Pat and two very attractive ladies sat down on a couch together to answer prayer. Now I could see if someone wrote or emailed prayer requests, but that is not how it was handled. Pat and the two ladies closed their eyes, joined hands, and then one of them said, "I see you. You have terrible neck pain. It is on the left side and you can't move your head without intense pain. Oh, Lord Jesus heal! Looord heeeal this pain! I know you are going to be healed." "Wow!" thought I. "This is really cool. You don't even have to write these guys; they can see you. Gosh, I wonder if the CIA or NSA knows about this? Think about all of the money that we could save on spy satellites." They continued, with eyes closed and heads bowed, praying for all sorts of physical ailments. They would seemingly see a person suffering, describe the symptoms, and then let us all know that Jesus would make things right.